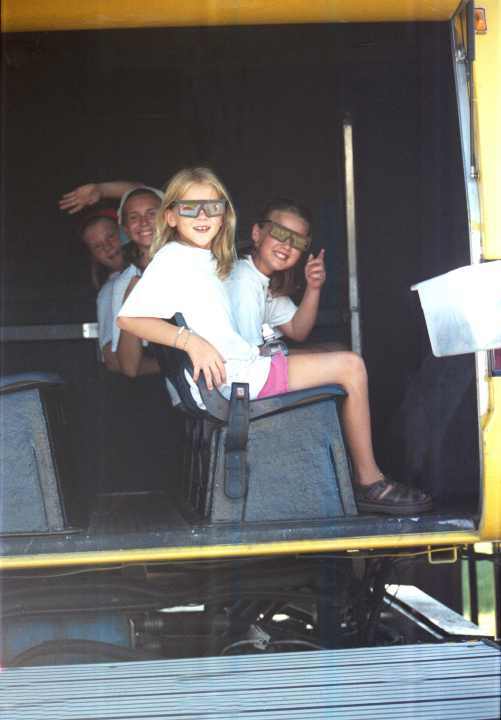 This kids have a chance to take a ride in one of these hydraulically actuated flight simulators. Kids programs, nationally, are doing wonders for our kids, but this kids program is rather unique in that it focuses on kids from public housing projects. In these housing developments, four out of five families are single parent families, mostly having the mother raising the family. With the Y-I-BET program, kids have a chance to do exciting things that are super educational at the same time. Flight simulators, whether they are on your home computer or something at an airshow can make a big difference. Sitting in a flight simulator, these kids are really at the airshow now. This is the inside of a hydraulic flight simulator. Click on the photo for a close-up view. The Quad Cities Air Show gives everyone a chance to participate in some kind of activity. Whether it be a flight simulator or a bungee jump kids can do it all. This airshow also has many vendors selling toys, models, posters and just about anything else you can imagine. The quad cities airshow also had an interesting, very large size, inflatable, Titanic game which you can climb on and feel the sensation of sinking. Click Here is a flight simulator which gives you the feeling of motion and provides a 3-D movie to boot. Flight simulators teach kids about airplanes and advanced technology. This simulator ride came with 3-D glasses, shook us around with hydraulic actuators and gave us a tour of Hawaii in a helicopter chase all at the same time. Magnum, Look out! These kids are on your tail. This particular simulator bit the bullet because is was more like riding on a slow moving boat, it was hot, the video wasn't very clear and the kids just said it wasn't very much fun. At the same time, the kids did have the experience and learning involved in the ride. At the Museum of Science and industry in Chicago, there are flight simulators that look just like this one but are very exciting to ride on, so don't let the review of this ride discourage you if you get the chance to ride on one. Even the bad ones are worth the money for the experience.